July 28th 2017 I submitted my application for Kitsap Bank's edg3 fund small business competition for $20,000 with mere hours to spare before the deadline... a computer click that sent me down the most incredible path of learning, and the spark that created this website. A couple weeks later I got the incredible phone call notifying me of the amazing news of being one of the 16 semifinalist! A new website, and voting period later and I got the next phone call moving up to the final five. 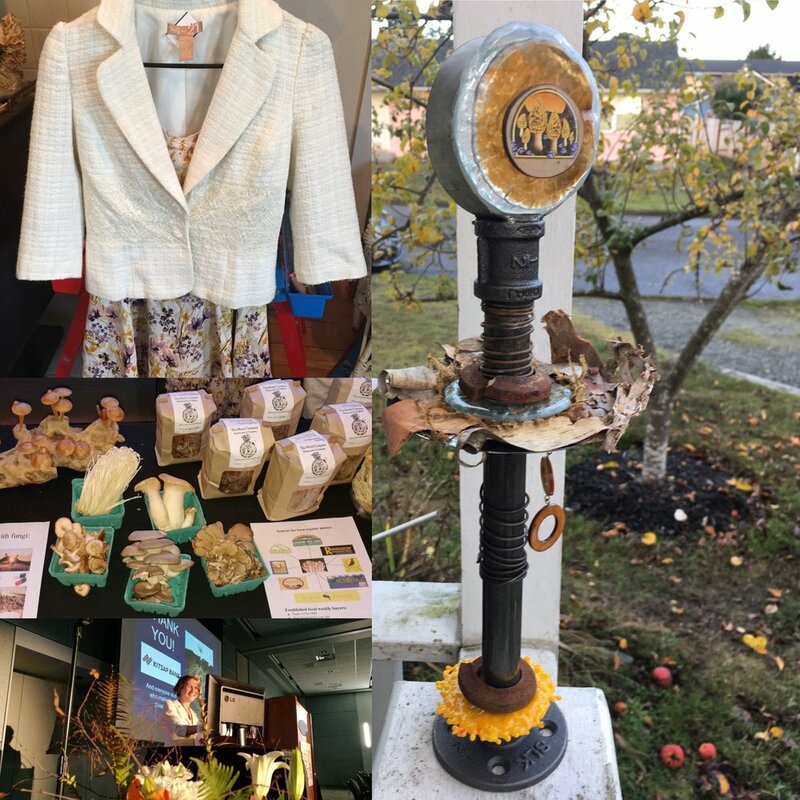 It was an epic learning curve, and way too much time on social media, but gratefully I had a five day retreat from motherhood, and business to be inoculated by inspiration from some of the leading women in mycology and other mycophiles. The vacation was perfectly transformative, I got to see some wonderful old friends and gained such amazing new ones. Not to mention hope for the world I was able to bring home from all the work they are doing in this world, along with the pride of being treated as an equal by them in this fight to heal this world. My whole October was full after that event, from birthday to my favorite fall event Barter Faire so Edg3 was put on the back burner, and then something happened within my own personal world, specifically regarding my daughter and my world was turned upside down. In desperation I threw together a slideshow before I wrote my speech and sent it in within the deadline. Then wrote a speech inside the conformation of the slideshow that was wayyyyy longer than the 5 minute maximum. Thankfully I got help my incredible professor Laura Starkavitch from whom I had taken public speaking in 2016, but the truth is my head was not in the game, literally. Unfortunately, stage fright and lack of practice I choked royally, my speech went too long, and there for I missed the most important business parts and primarily they heard about me and I life, but that's ok. Next time there won't be any slides, I don't fit well inside boxes, even the ones I have built for myself. As soon as leaving that stage a mountain was lifted from my shoulders. I really put way too much energy into the whole thing and that is where I came out the real winner. So even in "losing" I gained this website, this fun little platform for my writing muses, and the skills to edit and create powerful little videos (both fulfilling teenage dreams for my future of being a cinematographer and a writer). Through one of the people who was there that night, I will have a team of several students from Wester Washington's Business school extension in Poulsbo helping me with the nitty gritty business stuff from April till June. Truthfully, I am overflowing with gratitude for losing. As I stepped away from that frenzy, I was able to breath again. I didn't start this business to cater to business people and bankers, yet I would love to build an abundant life from it eventually, and perhaps even financially make an impact on my community, but hours in front of a computer, and researching market trends had turned me into one stressed out and snappy momma, and I got into this so I can inoculate a better world for my daughter with her by my side. Taking a step back this winter has been marvelous, and now with a new home space to root down for the two of us things are good, my hands are getting dirty, and things are growing again. I have found new ways to step forward with less stress, let debt, that feel good and true to my own path instead of conforming to expectations. 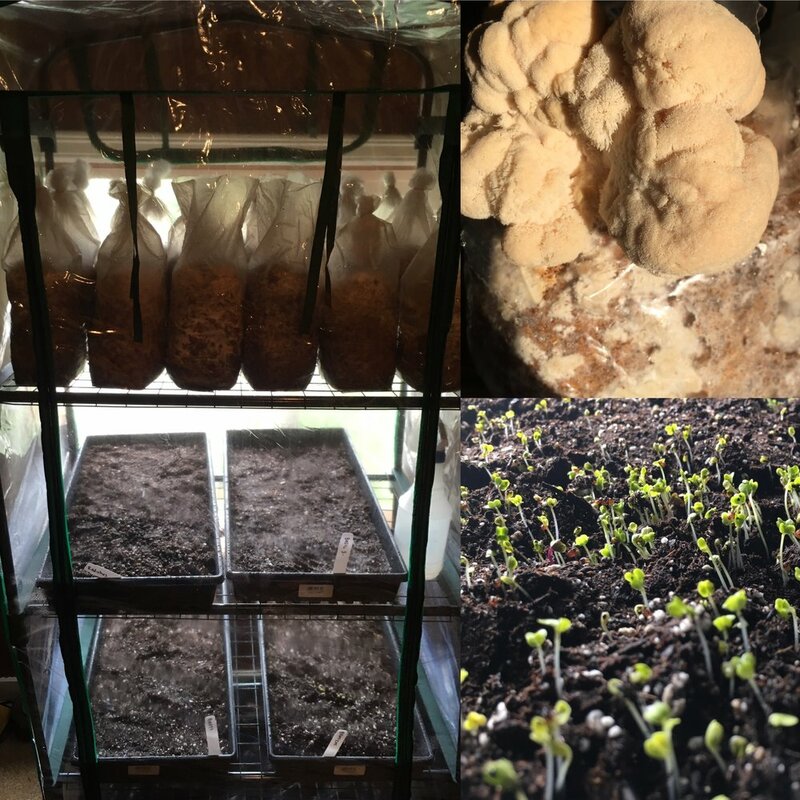 So right now I have tiny 3' X 1.5' x 5' greenhouse chalk full of micro-greens and mushroom bags, my 6' by 8' will be getting cleaned out this week and ready for this next season, and I get to share my passion of mycology on April 28th... perfect little steps in the right direction. So with gratitude I will move forward, and I look forward to sharing the evolution and growth.